Maria-Jose Vasquez, 19, chose a grilled chicken sandwich, asparagus salad, and fruit at Boston University. For Brandeis junior Brandon Frank, it was the lack of exercise that got him. He’d played tennis in high school, but couldn’t find time in college. That, combined with the soft serve ice cream and dining hall pizza he treated himself to each weekend, tacked on seven pounds by the end of his freshman year. Many universities have instituted healthy eating programs in recent years, but just telling students to make healthy choices often isn’t enough. So some schools are going further. This year, the University of Massachusetts is testing a new salad bar intended to show students which ingredients make the healthiest meal. Suffolk University dining halls will offer plastic MyPlates — based on the USDA’s MyPlate nutrition guide — proportionately divided so students can see how much of each food group they should be eating. 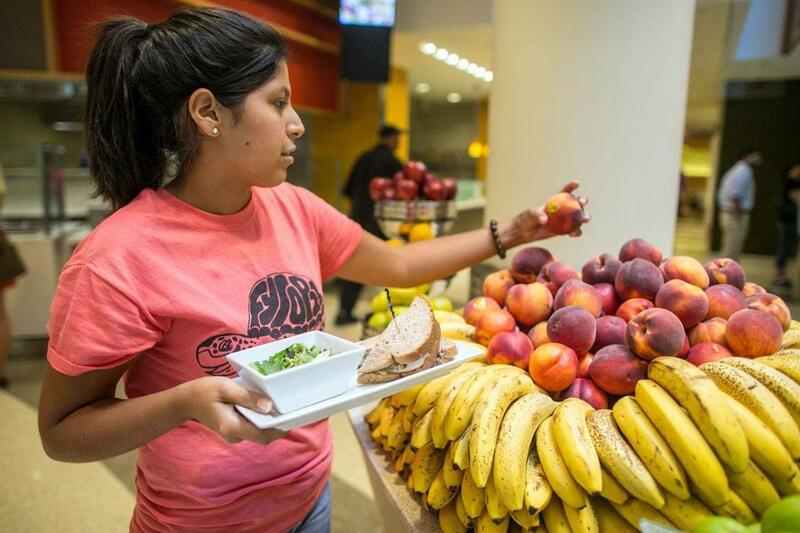 Boston College is launching a student health-coach program, to train students about nutrition so they can educate and collaborate with dorms and campus groups. Those decisions are paramount when 78 million adults nationwide are classified as obese and have a Body Mass Index greater than 30. The extra pounds not only make people unhappy with how they look and feel, but they increase the risk of type 2 diabetes, heart disease, and sleep apnea. While that may be true, many students — raised in era of 20-ounce soft drinks and restaurants featuring bottomless pasta bowls — have little grasp of serving sizes even when they try to eat well. Danielle Shargorodsky, who oversees nutrition programs for about 50 schools in New England for the food service company Sodexo, said students automatically think eating salad is healthy, for example, but that’s not always the case. Sodexo is rolling out a new salad bar program to educate students about which ingredients to use to make nutritious offerings such as Chinese chicken or Caesar salads. “I get questions at all the colleges like, ‘I’m eating salad and gaining weight. What’s going on?’ ” Shargorodsky said. Of course, when students saturate their salads with a cup of ranch dressing — which totals more than 1,000 calories and 120 grams of fat — that’s going to lead to weight gain, she added. Then there are students — presented with dining halls and meal plans brimming with pastas, stir fry, beef, casseroles, pizza, apple pie, and ice cream all at once — who simply don’t know how to handle the abundance of food choices, according to nutrition specialists. At home, if a parent made chicken for dinner, then chicken it was. “Students come in, and they have no idea what they should be eating for breakfast, lunch, and dinner,” said Sherrie Delinsky, a psychologist and eating disorders specialist at McLean Hospital. At Brandeis, where a nutritionist is available for consultations and the dining halls offer local and organic foods, many students still find themselves struggling to eat right. Brandeis nutritionist Laura O’Gara provides counseling for about 25 students a week, but finds the number spiking midway through first semester. “After just having a free-for-all when it comes to eating, they realize that they’re not feeling so well, and they can maybe use some advice,” she said. While many students need to be educated about healthy eating, said Delinsky, colleges championing nutrition should be mindful of students who have eating disorders or believe they need to diet when they don’t. “The message has to be done in a thoughtful way so people don’t become more obsessed with food and more afraid to eat certain foods,” she said. Delinsky authored a 2008 study in the journal Eating Behaviors that found the “freshman 15” — a term referring to first-year weight gain, popularized in a Seventeen magazine article in 1989 — is a myth. The 336 college women she studied gained an average of 7 pounds by the end of freshman year. Another study showed that 25 percent of female freshmen lose weight by the end of the school year. Jay Zagorsky, an assistant BU finance professor and researcher at The Ohio State University, used the National Longitudinal Survey of Youth that has collected data on a random sample of 9,000 people since they were teens. Of the 7,418 students who responded, the average weight gain after freshman year was 3.1 pounds for women and 3.5 pounds for men. Binge drinkers (classified as having six or more drinks four days per month) put on an extra pound a year. Beside steering clear of alcohol, not being faced with fatty (if delicious) food in the first place may be the biggest help of all for students. At Boston University, food that complies with the Department of Agriculture’s 2010 Dietary Guidelines is labeled with a red heart wearing a chef’s hat. The so-called Sargent Choice sticker (named for the school’s Sargent Choice Nutrition Center) above meatloaf, for example, means the dish was made with lean turkey, while Sargent Choice pizza contains reduced-fat cheese and whole wheat dough. More than 85 percent of students recognize the sticker, according to Stacey Zawacki, director of the Sargent Choice Nutrition Center. Zawacki said many college dining halls label nutritious options or use display cards listing ingredients, but the center decided to take it one step further. “The food has gotten healthier each year,” said Hannah Nichols, a School of Public Health graduate student, who has eaten dining hall fare the past four years. There are still burgers and fries available, Nichols said, but the chicken fingers and mozzarella sticks have disappeared. She looked at the remains of the grilled chicken sandwich she had for dinner and realized it had a whole wheat bun. “They’re providing healthier food, and we don’t even know they’re doing it,” she said. Boston University junior Fannar Arnarsson, who was opting for the Sargent Choice granola with yogurt for dessert, said he understands why some students gain weight in college. Before transferring to BU, he attended the University of North Carolina at Greensboro, where he said meat patties sandwiched between two glazed doughnuts was regularly featured on the menu.